LOCAL residents in need will benefit from increased funding for emergency relief organisations from both state and federal governments. 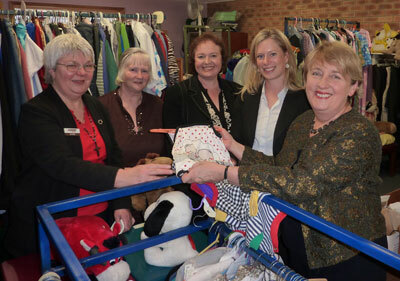 Looking over the items in the UnitingCare Op Shop are, from left, Jo Kelly (UnitingCare), Op Shop Manager Olive McVicar, Senator Carol Brown, Labor Candidate for Lyons Rebecca White and Minister Jenny Macklin. Minister for Families, Housing, Community Services and Indigenous Affairs, Jenny Macklin visited UnitingCare Bridgewater/Gagebrook recently to announce additional funding for the church. Tasmanian Senator, Carol Brown and State Minister for Human Services, Lin Thorp also announced additional emergency relief funding of over $134,000 for UnitingCare Tasmania. “The extra funding will help provide support to local people who require assistance in these tough economic times” Senator Carol Brown said. “Those people who use emergency relief services are some of the most disadvantaged and socially excluded in our society, so this funding demonstrates the State and Federal Government’s ongoing commitment to support these Tasmanians,” Senator Brown said.